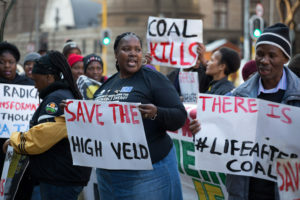 Yesterday, the interdict application launched by the coalition of eight organisations challenging the proposed coal mine by Atha-Africa Ventures Pty Ltd inside the Mabola Protected Environment and Ekangala-Drakensberg strategic water source area came before the Pretoria High Court. This morning, the Court granted an order which had been agreed between the parties, recording that Atha-Africa has given the coalition a written undertaking that it will not commence any mining or mining-related activities before giving 3 weeks’ prior written notice to the Coalition’s attorneys. Atha-Africa also agreed to pay its own costs in opposing the Coalition’s interdict. In its opposition to the interdict application, Atha-Africa had demanded punitive costs orders against the coalition and its attorneys of record, the Centre for Environmental Rights. The effect of the order is that Atha is now obliged to give 3 weeks’ written notice to the Coalition’s attorneys before commencing any mining or mining-related activities. This is important because the Coalition is challenging all the licences granted for this mine, and Atha and the Coalition are not in agreement about what licences this mine would require. In view of the irreversible damage that would be caused by mining in this important area, the Coalition will take all steps necessary to prevent mining from commencing, including further court proceedings. Atha-Africa’s mining right required it to start mining within 1 year from which its environmental management programme was approved, which is today. After the Coalition’s interdict was launched on 20 June 2017, Atha-Africa made application to the Minister of Mineral Resources for an extension of this period. a judicial review of the Environment and Mining Ministers’ decision to allow mining in a protected area, to be launched shortly. Atha-Africa also still requires land use planning approval from the local authority. The Coalition opposes such approval. The coalition opposing this particular mine – Earthlife Africa Johannesburg, the Mining and Environmental Justice Community Network of South Africa, Birdlife South Africa, the Endangered Wildlife Trust, Federation for a Sustainable Environment, groundWork, Association for Water and Rural Development (AWARD) and the Bench Marks Foundation – are non-profit organisations working to realise people’s Constitutional environmental rights to clean air, clean water and health, and sustainable, decent jobs. We defend the rights of all interested and affected parties, particularly local people, to be consulted on new developments, and to benefit equitably from them. The coalition opposes this mine because the proposed mine would be inside a declared protected area and a strategic water source area. It will threaten water security not only in the local area, but in the region. The damage that this mine would do to water resources cannot be undone. All these organisations are deeply committed to job creation and improving the quality of life of local people, but we also know that coal mining has devastated the lives, health and well-being of communities across the Highveld. Any statement in this media release to be attributed to Catherine Horsfield, Programme Head: Mining, Centre for Environmental Rights. For media queries and requests for comment, contact Melissa Fourie on 021 447 1647. For other enquiries please contact Annette Gibbs on agibbs@cer.org.za or 082 467 1295.